Holiday lodge. Features: Outside. Hot Tub. BBQ. Patio dining set. 2nd Bedroom. Twin Beds. Wall Hung Digital T.V Plenty of hanging space. Fully fitted Kitchen including dishwasher. 40 inch T.V and DVD Player in Lounge. patio doors leading to deck and hot tub. Brand new lodge in excellent order. Dogs welcome by prior arrangement, max 2. Gate from decking leads to 8 Acre dog field. Lovely place to come & get away from it all. We had an absolutely lovely time. The lodge was perfect and well equipped. It had everything we needed for a comfortable stay. 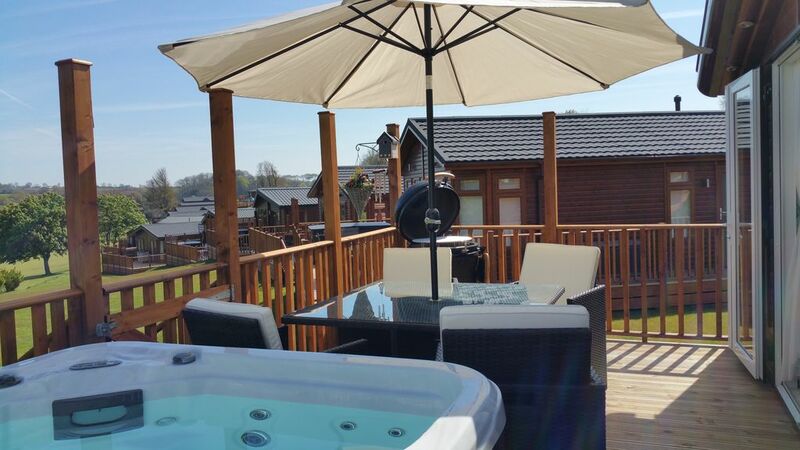 The setting was lovely and we thoroughly enjoyed the use of the hot tub with the view. We definitely want to come back.